☛ Seven Samurai (Shichinin no Samurai) by Akira Kurosawa, Japan, 1954. Intermission card from 01:46:45 to 01:51:46, Criterion Edition. This intermission card arrives 107 minutes in Akira Kurosawa’s 1954 film Seven Samurai. It lasts approximately 5 minutes and is accompanied by a music score by Hayasaka Fumio. At the time of writing, it can be watched on YouTube. At 207 minutes, Seven Samurai is considered Kurosawa’s longest project1. In what follows, I explore the idea that the film’s intermission may be an interruption of the story, but that as such –as an interruption– it nonetheless remains an integral and important part of the storytelling2. In other words, the story may be interrupted for five minutes, but those five minutes participate to the cinematic experience as a whole. The premise of this argument –which I won’t dive into– suggests a distinction between the mere story (if for a moment we can fathom the idea that it could exist by itself) and the experience of storytelling which brings together, in a shared process, the story and the audience experiencing it.3. The intermission in Seven Samurai is built-in: the story is interrupted, but not the projection. A 5-minute-long strip of film (roughly 450 feet) with an almost-static intermission card is presented along with a music score. The intermission was not meant to allow for a change of reels, but rather for some other exhibition purposes: for the spectators to stretch their legs and maybe for the exhibitor to get a chance to sell some merchandise4. 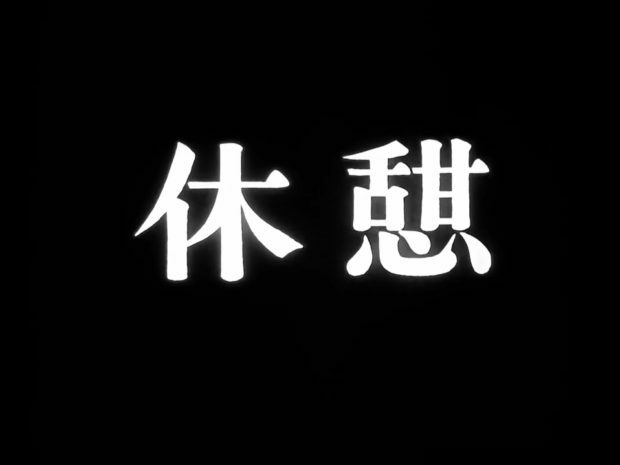 The slight jiggling of the intermission card resulting from imperfect image registration as the film passes through the projector’s gate testifies of the ongoing projection. So does the subtle pulse of halo surrounding the kanji character for “intermission” (a pulsing that found its way in Criterion’s digital transfer)5. 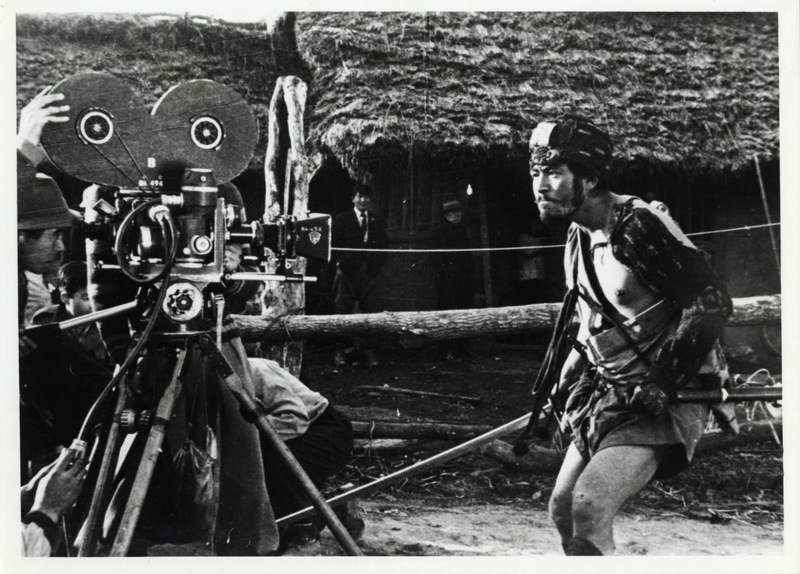 If only for those technical artefacts, the intermission in Kurosawa’s Seven Samurai could be said to be an experience in cinematographic continuity. Gif animation of an excerpt from the intermission card posterized in two tones to enhance variation in brightness from one frame to another. The intermission may yet play another role in this particular film, even if inadvertently. While it awaits the second part of the film –enjoying the pause or being annoyed by it–, the audience is offered the opportunity to experience a certain discrepancy. Indeed, there is something curious –if not striking– in thinking that an audience already enjoying leisure time might need a break, especially against the backdrop of what is happening onscreen. The intermission highlights the existence of a gap or a difference between the audience’s reality and the reality depicted by the film. This difference distinguishes the realm of entertainment and consumption –to which the spectator belongs and participates–, from the realm of the story, which has to do with survival in 16th century feudal Japan. Therein lies the other potential role of this intermission. The intermission card –which is played half way through the film– addresses the spectator directly and exclusively, as the consumer of a spectacle or a cinematic event. A paratextual element6, the 5 minutes intermission, with its text and music, remains completely foreign to the story. It is of no concern for the farmers, the samurai nor the bandits. Rather, it is concerned with the socio-economic conditions of cinematic exhibition and spectatorship. While the audience may very well get a break, the persecuted farmers get none. This is core to their tragic situation and reminiscent of the relentless disasters mentioned by a character at the start of an earlier film by Kurosawa. The intermission unveils a chasm or a fracture between the audience and the protagonists, through which the former may nonetheless relate to the latter7. Such is the interruptus: a “rupture” that marks the existence of a “between”. Set photography for Seven Samurai. Retrieved from Akira Kurosawa Digital Archive. ID 01.14.04.917. In Seven Samurai the intermission may operate as a “critique of separation”. When it does, it works both ways: it not only interrupts the story, but the experience of spectatorship as well. It interrupts the most familiar experience –being entertained by a movie– and brings it to the forefront of consciousness as a problem. Why should I have a break while the farmers have none? Am I being entertained by the famers’s misery? In this process of interruption, what was once taken for granted becomes strange11. The privileged position associated with spectatorship and consumption appears unreal while fiction seems to points beyond entertainment and towards real struggles. 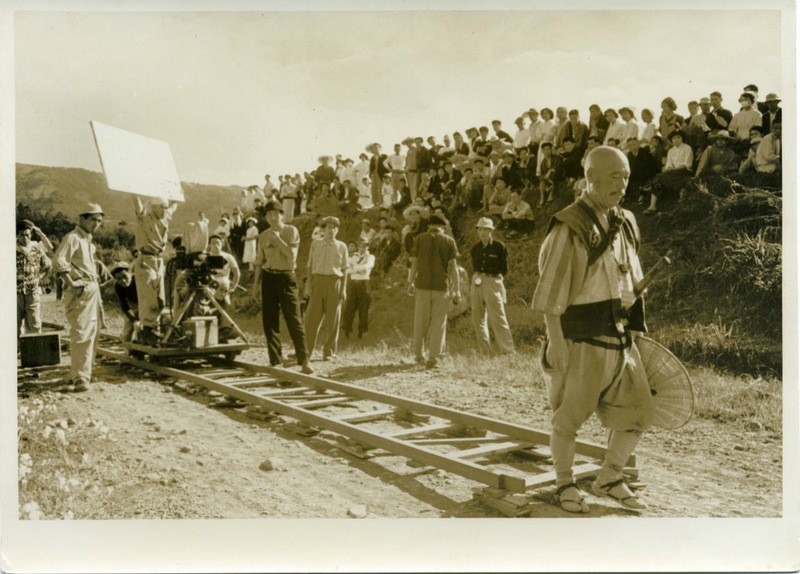 Set photography for Seven Samurai. 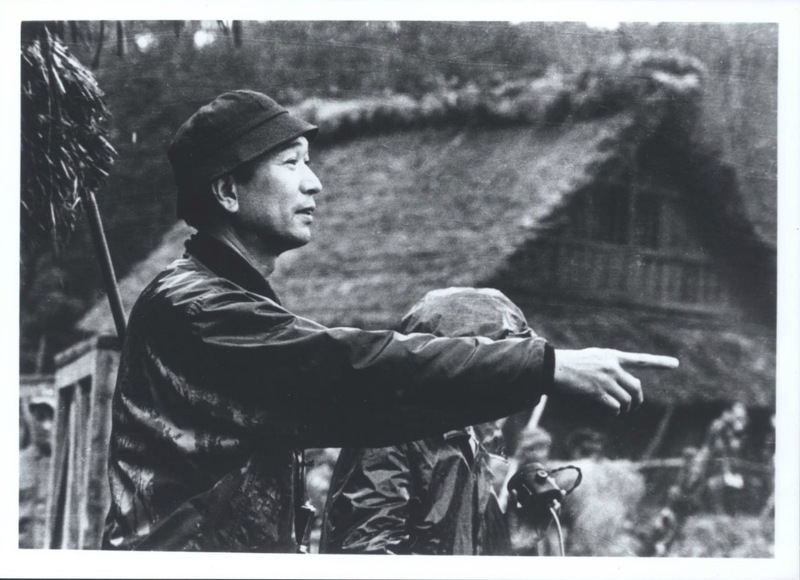 Retrieved from Akira Kurosawa Digital Archive. ID 01.14.04.949. There are three outlying houses, but 20 in the village. We can’t risk 20 to save three. And if this village is destroyed, those three cannot survive on their own. Is that clear? This is the nature of war: by protecting others, you save yourself. If you only think of yourself, you’ll only destroy yourself. The intermission immediately follows those lines. In the middle of the film, the spectator is released, discharged from the story, as if sent back –if only for a short while– to his own life conditions. He is given a break to stretch his legs, but also to think about Kambei’s speech. The conditions of his life are not his alone, but actually shared conditions. He shares them with the rest of the audience in the movie theatre, with family members, neighbors, friends, and co-workers. Instead of passively consumming a story like any other product, the spectator may awake to the foremost quality of storytelling: “the ability to share experiences”, as Benjamin once explained12. The intermission was not likely designed to achieve the “interrupting” function discussed above. If and when the intermission works in such a way, it may nonetheless participate to elevate the classic samurai movie above mere entertainment, to make it something more than a thrilling action spectacle or an elaborate historical piece. It opens up additional opportunities for discussions about shifting cultural traditions, class struggle and social bonds in time of great turmoil13. More importantly, it suggests that more than 50 years after it was made, Seven Samurai still manifests a rather striking contemporaneity. The Chinese pictograph for resting was a person 人 beside a tree 木. They first put it together as 人木. Then, as with the kanji 毎 MAI, above, they decided that the person 人 had to change its shape to blend with the other element in the kanji square. In the composite kanji every 毎, the element for mother 母 was rather short and wide, so the element for person 人 was added at the top of the square instead of beside the mother 母. In the kanji for resting, the element for tree 木 was tall and thin, so the element for person 人 had to be added at the left-hand side of the square instead of at the top. The Chinese changed the shape of person to fit the left-hand side and drew it 亻. They wrote the new kanji 休. It means rest, or take a break, or take a holiday. (Read Japanese Today: The Easy Way to Learn 400 Practical Kanji by Len Walsh, Tuttle Publishing, 2014, p. 32). For an in-depth etymological analysis of the kanji character for “rest”, see this at Beyond Calligraphy “Kanji: 休”, by Ponte Ryūrui (Oct. 4, 2011). 11. Turning the familiar into something strange is also a device of “epic theatre”. Depending on the translation of Verfremdung, it is refered to as the “alienation effect” (or A-effect), the “verfremdung effect” (or V-effect) or the “estrangement effect”. The term was first coined in Russian (“приём остранения”) by Viktor Shlovsky in his essay “Art as Device” included in his 1925 book Theory of Prose (see Alexandra Berlina’s 2015 translation in Poetics Today, Volume 36, Number 3: 151-174). In “A Short Organum for the Theatre” published in 1949, Brecht writes “A representation that alienates is one which allows us to recognize its subject, but at the same time makes it seem unfamiliar.” (§42). Benjamin suggests the estrangement process is made possible by interruption: “Rather, the first point at issue is to uncover those conditions. (One could just as well say: to make them strange [verfremden]) This uncovering (making strange, or alienating) of conditions is brought about by processes being interrupted.” (Understanding Brecht, 1998: 19). 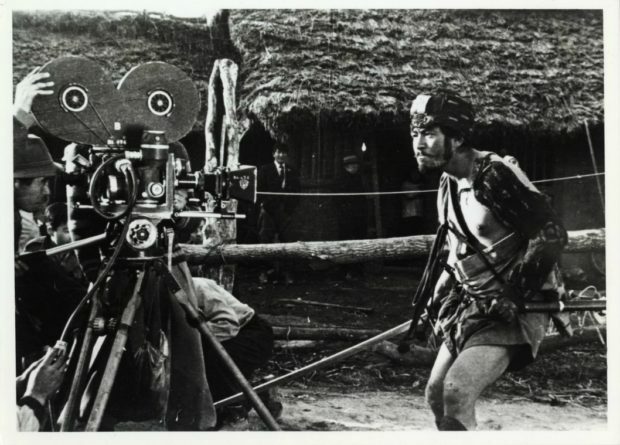 Set photography for Seven Samurai. Retrieved from Akira Kurosawa Digital Archive. ID 01.14.04.939.